This 3D printer build is a thing of beauty. It prints in ABS plastic on quite a large base. The platform provides all of the X and Y movement, making the gantry stationary except for the Z axis. it is possible to print parts up to about 15″x15″ by 13″ high. The gray hose snaking down around the right side of the print head is a fume extractor, keeping the air clear around the PID controlled head, and heated base. Judging from the example items this prints with fantastic accuracy. Doesn’t the fume extractor cause cooldowns and warps the model? @Hackius, Eh. the airflow required to get the fumes out is minimal. i doubt the difference would be more than a degree or two. Side note….god i dont want to think how much that 80/20 costs…. Simply amazing. How much could it cost? look on ebay for the 80/20. they have a store there called “80/20 garage sale” or something. they sell scraps, odd lots, leftovers, cosmetic issue items, and stuff someone misdrilled with an odd hole or two already in it. trust me, what they consider ‘scrap’ is anything under like 6 feet. plenty for our needs. i bought like 2 grand worth of 80/20 from them for a few hundred bucks. Yeah the reprap is a brilliant project. Ive wanted one since the first beta posts on it came out. One of these days, Im gonna save up and find some one to print me one. If I was rich I would donate a bunch to the reprap team. PS this is NOT a true reprap. Reprap is by definition a self replicating 3d printer. IE it can print it self . Once you have one you can duplicate them. This is made of metal not plastic so I dont think the guys at reprap would condone calling it a reprap. Much the same as the thing o mattic , is not a reprap. Come on…. There doesn’t exist a reprap that can actually print itself. The leadscrews and electronics are an issue. Just because this doesn’t have little pieces of printed plastic holding the edges together is a pretty poor reason to deny it a reprap name. @addidis, we know. Its Reprap based. Much like the makerbot. @stunmonkey functionally and aesthetically the 80/20 is fantastic. But i cant justify spending even a few hundred on scrap. My entire 3d Sugar printers budget could easily fit in just the cost of the support material here. Not that im knocking the project, im just broke, and if i had the cash every thing from my projects to my bed frame would be made of 80/20. @robert yah its trivial i agree, This is an excellent build though. Definitely in no way knocking the build. If im being honest , im insanely jealous. As a long time lurker of CNCzone I can say that 80/20 is well worth the extra cost. There is no need to weld, which if done improperly leads to thermal warping. In addition it takes t-slot hardware that makes for secure quick connections. Being aluminum its light and if you’re brave can be cut accurately with a table saw. Like stunmonkey said you can get it on ebay and if you’re design is flexible you can wait for a great deal. What im amazed by is the quality of the parts this machine is making. I wish you wouldnt keep showing these 3D printers as one of these days Ill have to have a go and it will effect my wallet and my marriage. I like that the table handles X and Y. This is how nearly every normal CNC machine works, and it makes sense. Though I guess on 3D printing you don’t want to knock over your work by moving too quickly. I guess since you generally move slowly its not that big of a concern? And this machine does look great. Most of the little 3D printers look too feeble. If this machine actually produces better parts, I feel like it would be well worth it. I’d really like to see an estimate for the cost. Aren’t commercial 3D printers down to like $12k now? 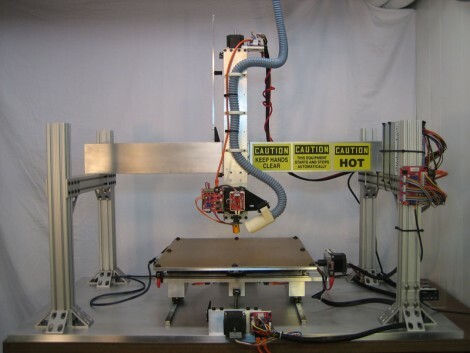 @robert, Adam: I’ve been pondering a DIY CNC build recently, and have wondered about 8020 for framing. I deduced that the additional cost goes towards a sturdier, and therefore, more accurate machine. I’m mostly planning on cutting wood, and some light aluminum (Tesla Turbine blades, for example), would a lesser structure suffice? I realize this ultimately depends on the build size, but I think it’d be best to save such detail for the CNCZone. Regarding the “RepRap” term: OK, so maybe it’s impractical to print everything down to leadscrews and silicon wafers for transistors on the machine, but the *spirit* of RepRap is that the machine can reproduce a significant portion of itself. What fraction of this machine’s parts can it produce itself? 1%? Maybe just the plastic nozzle for the fume extractor? It’s a 3D printer, not a RepRap. It’s not about size, it’s what you do with it. @tzangcr What a magical place that is! Thanks for the link. For 3d printing the strength of the frame is not really an issue as long as its rigid. Since your going to be milling (especially if you will be working with metal) the frame needs to be as solid as possible, I would go with the 80/20 if i were you. CNC machinist here chiming in to agree with Robert above me. Rigidity is extremely important if you start working with metals, for both repeatability, and machine/tool deflection. If the machine flexes, it will just move out of the way when it tries to cut something. That will also hurt repeatability, which limits your ability to make intricate parts. I personally wouldn’t want a CNC with anything worse than 0.001″-0.003″ repeatability if I wanted to make many useful things out of metal. I’d shudder to think of what would happen if I had, say, 0.010″ repeatability. Again, it all depends, but if you want to make something that spins fast like a tesla turbine, you certainly want good repeatability. But I have the luxury of being able to work with $70k HAAS CNCs, so I’m spoiled. I’m sure home CNCs with even 0.020″ repeatability or maybe even worse would have their uses. But anyway, you can see how, if 0.003″ is my worst case, you’d want a rigid machine. You’d be amazed at how much this stuff makes a difference. So Mr. Alexander, I work at a die and production facility that is slowly but surely being automated and am also tinkering with bowing a grand on a home built cnc. Most likely a ‘large’ desktop model with a barely used fourth axis. Any suggestions on something better than 80/20? We use it in scratch built automation and it is just okay for that purpose. Or for that matter a decent high torque spindle. I was thinking about getting just a 2 1/4hp bosch router and machining a gearbox to about 1:60 however I lack the money or clout with the boss to sneak in the gearing with a heat treating run and fear for the 35,000rpm interconnect gear becoming severely warped. I wonder what the stiffness/play of the lower build platform is with the double stacked linear bearings, particularly with the relatively small top one. Its probably not an issue with RP. Totally sweet machine though – very jealous. @Igor – I actually don’t even know what 80/20 is, but its clearly some of that pre-made metal bracket stuff. I’ve seen it plenty before but never used it. When I make something, I generally custom fab every part, so to make a big frame, I might contract with the local laser/waterjet cutter to have him make the large parts out of plate, and then I’d make brackets to bolt everything together. Or make things out of tube with custom brackets. But I’ve never made a CNC. I’d focus on rigidity and use thick plate and billet brackets for everything, if not just make everything out of billet. This IS an awesome build, and I can only echo all the positive comments about 80/20. Rapid prototyping is another excellent fabrication method, but multiple processes are still needed to make complete machines. There are a number of other T-slot companies as well, like Bosch, Faztek, etc, this is a German Idea from the late 60’s, early 70’s that seems to finally be getting broad popularity outside of conventional manufacturing. Here is another project using t-slot: http://www.cubespawn.com – I, too am poor – but I’m using T-slot because it has too many advantages to ignore – hopefully CubeSpawn will be melting and extruding t-slot and maker-beam in <5 years -from beverage cans and other scrap!! As long as the gantry is stationary, why are 4 legs needed? ? ?